1880’s 1/6th plate. Private Collection. A good looking, bright-eyed and high-cheekboned gentleman with the hint of a smile. Behind him you can see the foot of the device meant to keep his body still, a ‘posing stand’. Some photos of people with that device are commonly mistaken for post-mortems and unfortunately sold as such for much more than the photographs are worth. He’s resting his hand on a fringe chair so popular with photographers of the Victorian era. The fringed support area was adjustable and most often used for people to rest their arms on while seated. He looks taller than average for his era too. 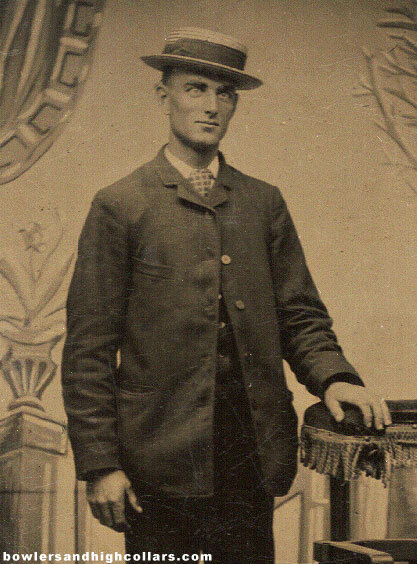 This entry was posted on Tuesday, April 21st, 2015 at 11:53 am	and tagged with 1880s-1890s, boater hat, fringe chair, props, sack suit, victorian and posted in Gentlemen, Tintypes. You can follow any responses to this entry through the RSS 2.0 feed.